Since Kasper was born and Sasha started school I have my hands full and there are days where I am too tired to do any elaborate cooking or baking. I pack Sasha cold lunch every day and some days I think it would be nice for her to have a sweet treat. In order to keep cookies, cakes, bars and the like a “treat” I don’t think she needs to have a cookie every single day in her lunch box. Which means I don’t need to have a batch of freshly baked cookies sitting around tempting us. Since Sasha has started school Penelope has been pretty lonely so I am trying my hardest to do fun activities with her to occupy her time. Both my girls love to help out in the kitchen so baking cookies seemed like a perfect activity. Penelope pulled up a chair and we started mixing up these tasty cookies. Instead of baking them I scooped them and rolled them into balls. Laid them on a parchment lined baking sheet and threw them in the freezer. Once the cookies were frozen solid we put the cookie balls into a freezer bag and tossed them back into the ol’ ice box. Now in the morning if I think Sasha should have a sweet treat in her lunch box I can pull a cookie ball out and bake it in the toaster oven while she is getting ready for school. Not only is this a perfect way for me to give Sasha a special treat, but if we haveÂ impromptuÂ guests over I don’t have to slave away making a dessert, these cookies go from freezer to plate in about 15 minutes. You can add any sort of “chip” into these cookies. 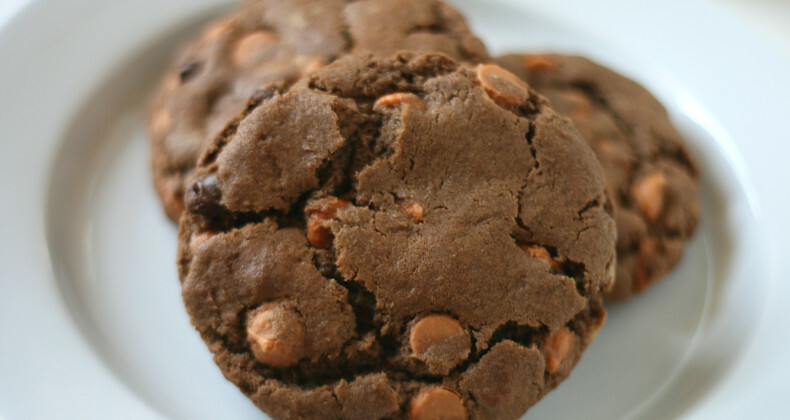 I’ve made them using peanut butter chips –YUM and butterscotch chips –equally delicious. I add a package of instant pudding to these cookies to give them a soft (not too soft), moist texture. These cookies have a slight crispy outside and a soft slighty chewy inside. Utter perfection, in my humble opinion :). I hope you give them a try! Before I froze a bunch of these cookie dough balls I really didn’t keep desserts on hand. Now I have a gallon freezer bag full of cookie dough balls sitting in the freezer this moment. In mixer beat on medium speed butter, sugars, pudding and vanilla until blended. Add eggs and mix well. Add flour and soda in small batches until all incorporated. Stir in chips by hand. Bake frozen cookie dough for 15-18 minutes.